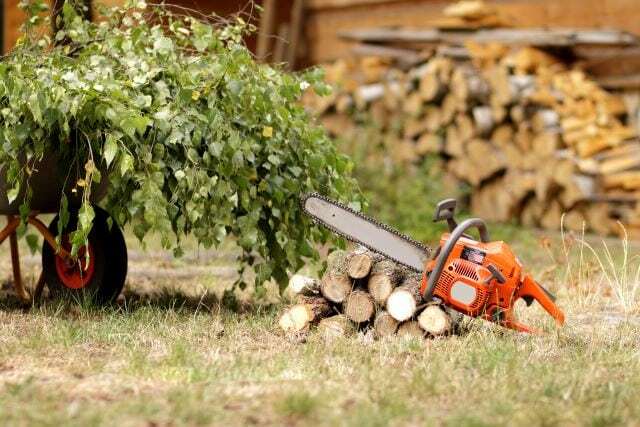 Have you ever used a chainsaw to cut down those trees in your backyard that are growing out of control? Or have you ever needed a chainsaw to cut wood to use as your main source of heat during those long, cold winter months? Maybe you have a need for a chainsaw for recreational or creative purposes. 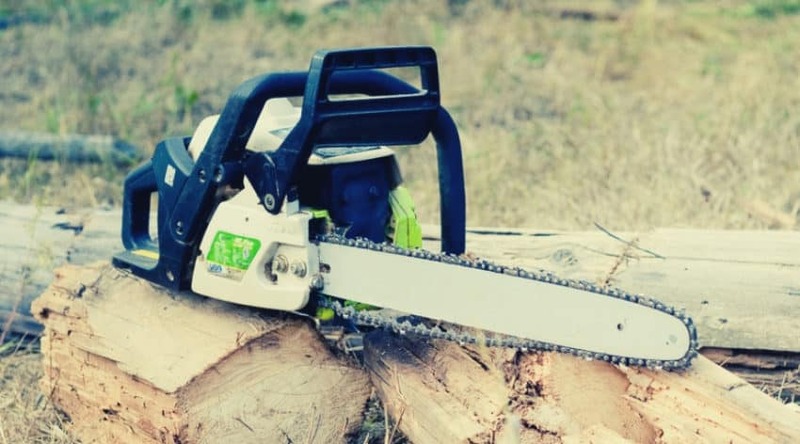 People tend to think that a chainsaw is only used if you burn wood as a source of heat during the winter, but chainsaws are becoming more popular to use in numerous other activities. People use chainsaws to carve driftwood into fantasy creatures straight from a novel or they use chainsaws to maneuver a large piece of wood into a unique piece of furniture. Regardless of the reason, you may need to own a chainsaw, there is an overwhelming number of possibilities, strengths, and blade lengths to choose from. But how exactly does a chainsaw work? Is there a possibility of long-term maintenance when you own a chainsaw? Let’s find out together down below! Sometimes to understand how something works, it is important to understand what exactly you have in your hands! A chainsaw is a portable saw that cuts through wood or wooden objects by the use of “teeth” running in a circular motion around a guiding bar. 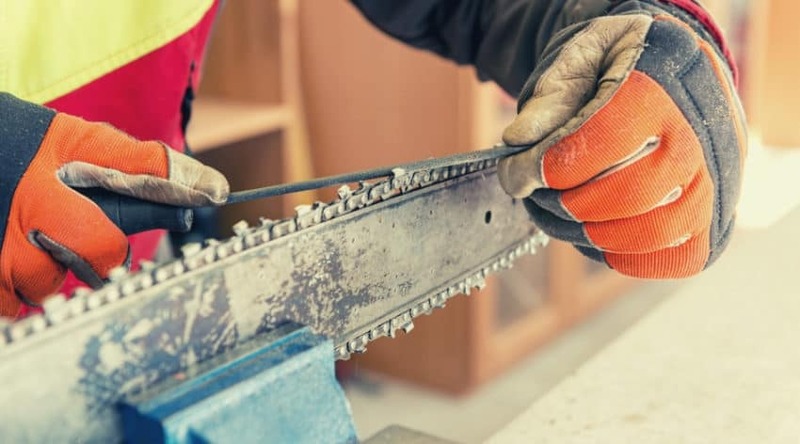 The “teeth” on the blade of a chainsaw is actually a metal chain that has notches or grooves at certain intervals to cut through even the hardest types of wood with ease. The speed of which the blade maneuvers in a circle with the aid of a guide bar depends on a couple of factors; one being what horsepower your chainsaw possesses and what speed your chainsaw engine responsible is for. A good chainsaw can be helpful in a wide variety of activities, from landscaping trees and foliage to cutting life-saving firebreaks in heavily wooded areas to ice sculpting during the winter! It is extremely important to practice extreme caution when handling a chainsaw for any type of activity, as while in operation, the blade of the saw is strong enough to cut through human skin, muscle, and bone. 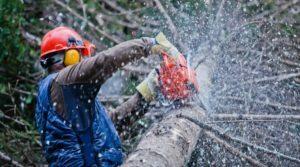 You can also purchase a particular type of pants and jacket that is lined both externally and internally with thinly interwoven wire that is made specifically to be worn during chainsaw operation. These articles of clothing are designed to stop a blade when it reaches the wire, regardless of externally or internally; which can prevent a fatal accident. A chainsaw is a complex piece of machinery that consists of both major and minor parts that all play an important role in cutting through wood or other material smoothly. 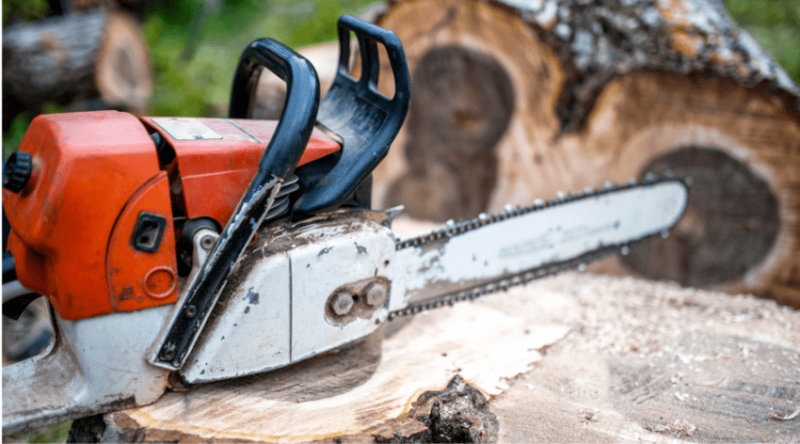 It is important to remember that without a vital part being connected or maintained; your chainsaw will not work to the best of its abilities and could potentially damage the wood you are trying to cut or cause a fatal injury. 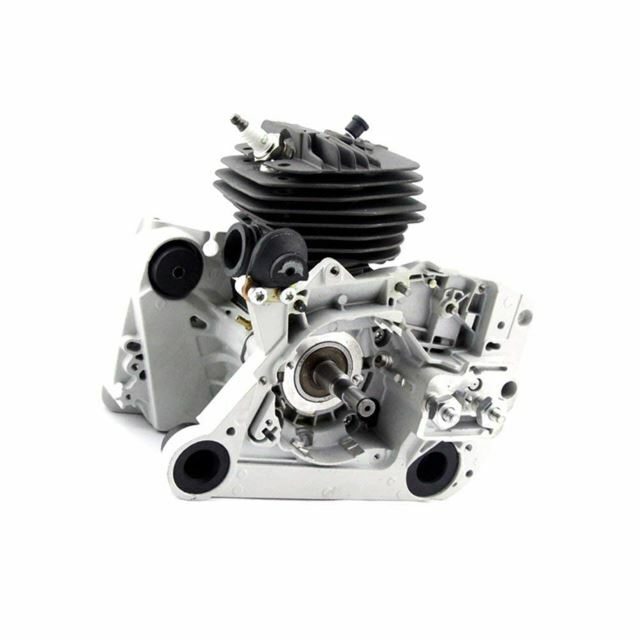 The first and foremost important part of a chainsaw is the engine itself. Without an engine, a chainsaw would actually be more comparable to a generic hand-held saw that requires intense physical labor to cut through wood. 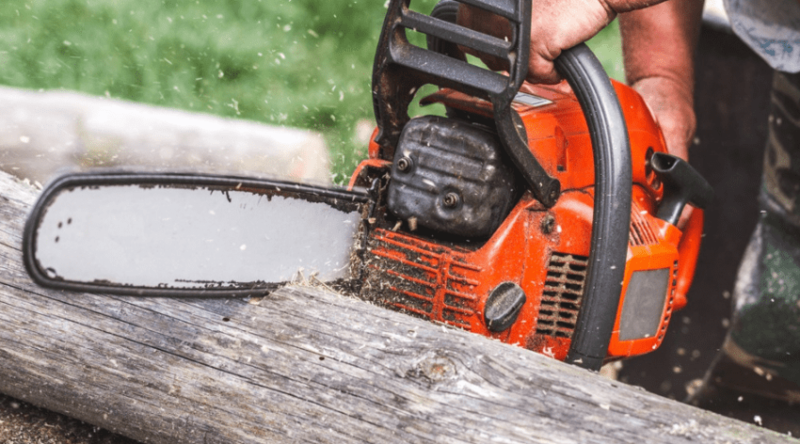 There are two styles of chainsaws: those that run via a gasoline-powered motor with an oil pump and ignition or electric chainsaws that would need to be connected to a steady power source for operation. The engine is where the chainsaw draws power to run the blade and chain in a circular rotation to cut through the wood. New to the market, but not as widely used, is the battery operated chainsaw. This style of chainsaw runs with the use of a lithium-ion battery, similar to those used in a cordless drill. These batteries will require frequent charging and do not possess the power those with gasoline/oil or electric engines do. This is the piece of machinery that channels air and fuel through the chainsaw to propel the blade and chain into a circular motion that cuts through the wood or material of choice. The drive mechanism is where the clutch of the chainsaw is located. The clutch is the part that can protect the engine while it is idling still or when the chain experiences a kickback (knot in the wood, etc.). If a chainsaw is experiencing kickbacks with each use, ensure that the chain and blade are still sharp enough to cut through materials. With the clutch engaged, the operator is additionally protected as it signals the chainsaw to stop in case of a kickback. 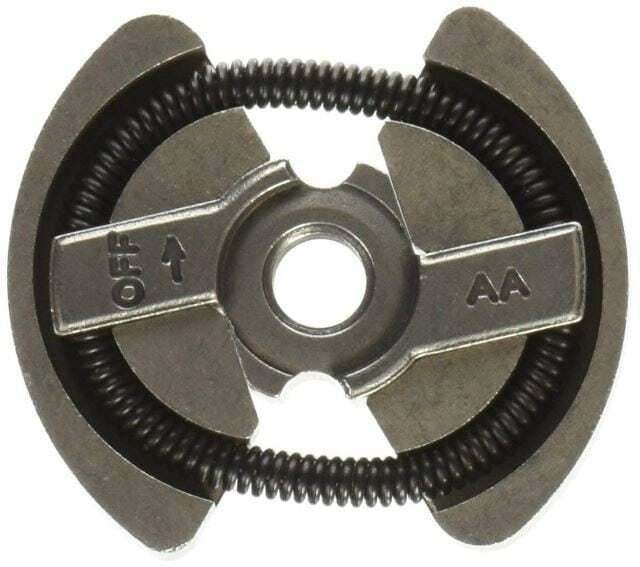 The chain brake is a miniature brake located in the same area as the clutch. 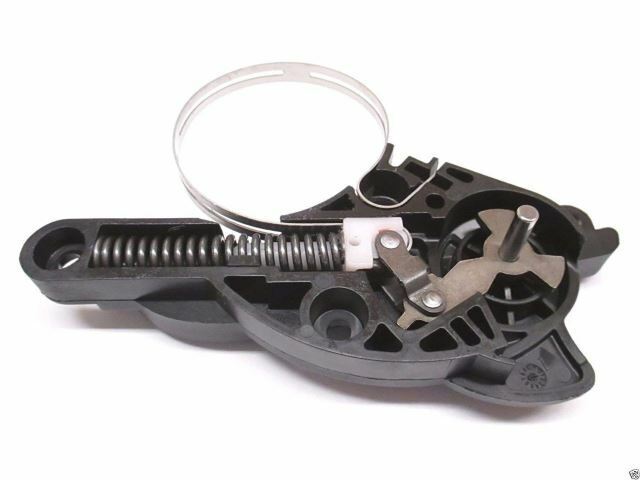 This mini-brake will take signals from the clutch when the chainsaw experiences a kickback and shut down operation of the chain and blade. The chainsaw will come equipped with a chain that wraps around the blade of the saw to cut through the wood. This is the piece of machinery that will literally run in a circular motion when the chainsaw is connected to a power source, whether that is electric or gasoline, and cut through the wood. It is extremely important to remember that a dull chain will not cut through wood or other material but instead the operator will experience kickbacks from the chain “jumping” off the material. The chain is one of the first parts that will require replacement after a period of use but the frequency of replacement will depend on a couple of factors: 1. What is the material the chainsaw is cutting through – wood, foliage, ice etc.? 2. The frequency of which you use your chainsaw – daily, weekly, monthly, etc. How exactly a chainsaw works is through the use of the aforementioned parts being powered in tandem to create enough friction to slice through a tougher material with ease. The engine is powered by either a gasoline/oil mixture or an electrical cord connected to a power outlet. 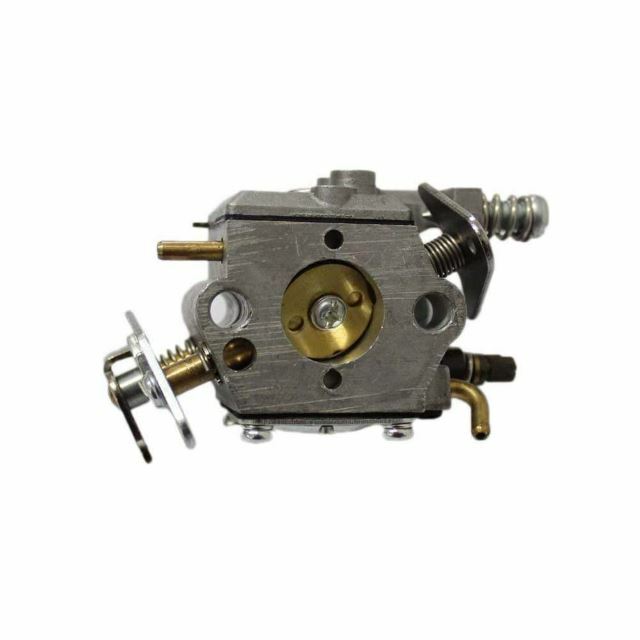 Air is then brought through the carburetor to flow through the chainsaw, powering the guiding bar and chain to spin in a circular motion. This motion will create enough friction to slice through wood or ice with ease. A chainsaw will either start by the use of a starter button or a pull cord, with safety shutoff valves located along the handle for ease and convenience. Always remember to shut off the chainsaw completely when it is not in use, as the chain will run at a high speed even when there is no material to cut through under the blade. It’s always important to remember proper safety when using this piece of machinery. Unsure you have chaps to cover and protect your legs, everything is sharpened and well oiled, and safety glasses to protect your eyes. The level of maintenance your chainsaw will require depends entirely on how often you use it. 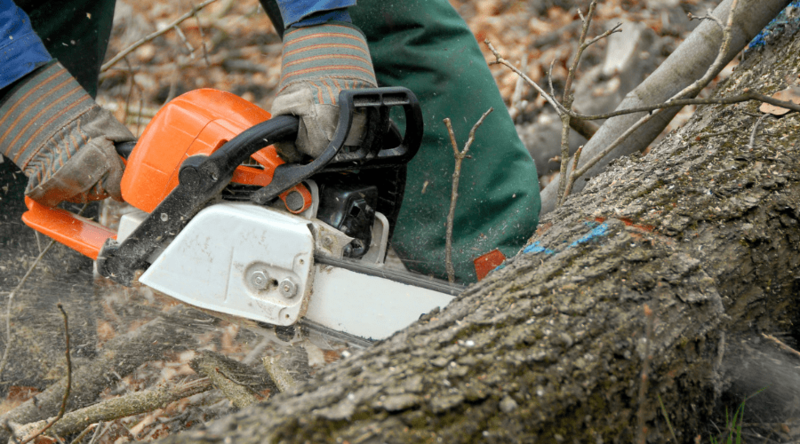 If you use your chainsaw on a weekly basis, you may find that you need to complete certain maintenance tasks before each use. A gas-powered chainsaw will require a higher level of maintenance regardless of the frequency as there are more items to check before starting operations with your chainsaw. Gauges, air-intake, and exhaust ports have to be free of debris, and all screws or bolts must be tightened to ensure safety. Also, an oiler is needed to keep the moving parts greased. Electric chainsaws will still require maintenance before use, as it is always recommended that the starter, exhaust output ports, and all nuts or bolts checked thoroughly before use. Regardless of the model of chainsaw you choose to use, it is important to note that after time, the chain and blade on your chainsaw will dull, whether with age or use. 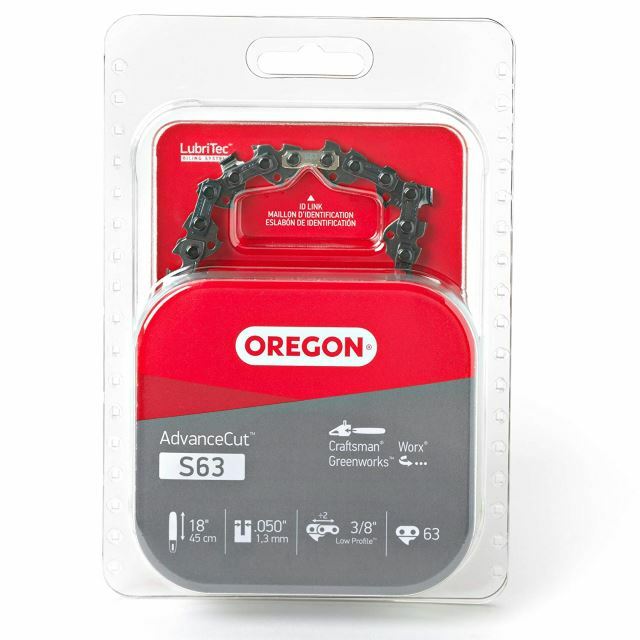 Always check the sharpness (safely) of your blade and chain, as a dull blade can bounce off what you are trying to cut and send the chain airborne into yourself, another person, etc. Now that you are informed of what a chainsaw actually is, how each individual part works, and what, if any, maintenance may be required of a chainsaw owner; it may be easier to determine what chainsaw would be the best for you to purchase. As a chainsaw is a product that can run into the hundreds of dollars, isn’t it better to be sure what you are purchasing is exactly what you want? Double-check for both retailer and manufacturer warranties on your new chainsaw and see what is required, if anything, of you for those warranties to stay in full effect. 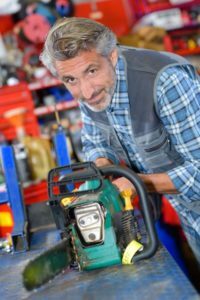 Ask questions of the salesperson, and if possible, ask for a demonstration on what it would take to control the chainsaw from the minute you start the engine to the time you turn it off. For a visual look at the internal workings of a chainsaw, check out this comprehensive YouTube video from RepairClinic.com to see a clear picture of how exactly your chainsaw cuts through wood! If this article was helpful and you would like to let your peers and/or family know how a chainsaw works, please feel free to share! Do you have a favorite chainsaw or know tips and tricks on how to make your chainsaw work brand new for years? Let us know in the comments below!